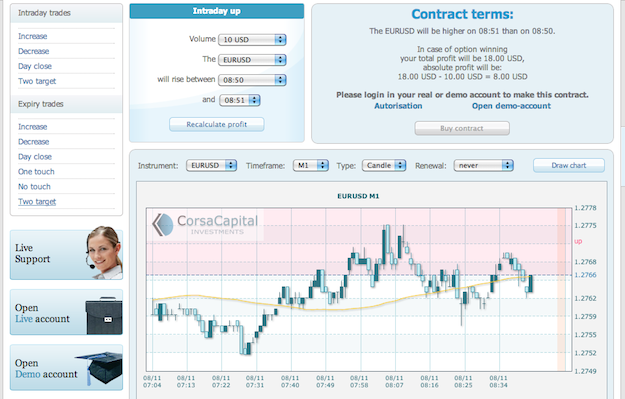 BinaryOptionsNow – Corsa Capital is a global provider of online trading services. The company was founded in 2007 by a group of professional traders meaning that it already has a lot of experience in the binary options business. The broker is also equipped with latest trading technology that results in a great trading experience for users. Corsa Capital is a binary options trading licensee of the renowned Instaforex binary options trading platform. This means that trading binary options at Corsa Capital is essentially the same as at Instaforex, only that Corsa Capital is a standalone binary options provider meaning that it specially focuses on satisfying clients’ need in this market. Corsa Capital is a financial service provider registered in the British Virgin Islands. The company is operating under the British Virgin Islands Business Company Act that requires these kinds of service providers to offer reliable and accurate services. The activities of the company are also supervised and regulated by the UK Financial Services Commission. The Financial Services Commission is one of the strictest financial regulatory bodies around. Only those services providers receive the approval of the Financial Services Commission that have proven to provide safe and fair services. CHF, NZD/JPY, EUR/GBP, AUD/CAD, NZD/CHF, CAD/JPY, EUR/AUD, AUD/CHF, AUD/JPY, NZD/CAD, CAD/CHF, AUD/USD and CHF/JPY. Non-forex assets include Gold and Silver. Most of these option types also allow traders to set the expiry time to be the closing of the market. These options usually pay out better because they involve more strategic planning and insight into the market as well as more risks., One Touch, Double Touch, and No Touch options. At this moment depositing money at Corsa Capital is only possible though WebMoney, Liberty Reserve and wire transfer. The lack of other mainstream payment tools might be a great hindrance for most of the causal online traders. The trading platform used by Corsa Capital is also the one employed by Instaforex. It’s a very simple platform that does not require a lot of time to understand and learn. Using the platform is very easy due to the intuitive and user-friendly interface. Traders are also given the opportunity by Corsa Capital to open a demo account before actually setting up to a real money account. The demo account will be provided with an account balance of $10,000 virtual money. This money can be used to try out all the options and functionality offered by the broker. The customer support department of Corsa Capital can be contacted through telephone, email as well as various instant chat applications. The chat applications provided by the broker are Yahoo Messenger, ICQ and Skype. Most brokers do not offer these options.